My twin sister is getting married soon. Really soon. Like, September soon. She’s been engaged for over a year now, but I still don’t think it’s really sunk in for me yet. Jas has lived with me every single day of our lives since we were conceived. Literally That’s 25 years, plus change since our birthday also happens to be in September. There are 9,131 days in twenty five years. Of those 9,131 days, I don’t think more than 10 (and I mean, 10 maximum) have went by that Jas and I have not seen each other. But come September, Jas will be moving out and living elsewhere from me. It’s not that big of a deal. It’s not like she’s moving to another state. Her house is about twenty minutes away from where we live now. She’s already informed me that she plans to visit here often and that I’m more than welcome to come over to her place, and I believe her. Still. The closer we get to the actual Big Day, I have to confess the idea of her moving out does feel a little…weird. It’s definitely gonna be different not having her here all the time. It’ll definitely be an adjustment. But I’m sure it won’t take too long for me to get the hang of it. On the brighter/less sappy side, I’m REALLY happy for my sister and her fiance. They’ve known each other for over ten years, and I could tell even way back when we were in high school when they were in that “just friends” stage that they were really into each other. They’ve always had a really awesome dynamic that at times, I have even felt myself being a little envious of. I think that the best couples are the couples that first of all, have a lot of fun together, and second, complement each other very well. That’s definitely the case with Jas and her guy. They’ve been friends just as long as they’ve been together romantically. They have lots of inside jokes. They like’doing things’ together, but they’re also just as cool with being together and ‘doing nothing’. They’re not similar people personality-wise, but the different elements of their personality work together really well. They just have a great relationship, and as a sister, I’m really proud of the choice that Jas has made for her life partner. The main ingredients for this dish kinda remind me of the relationship that Jas has with her fiance, as well as the relationship that I’ve seen with other happy couples. Maple syrup and curry powder. I know it’s maybe not exactly an union that may seem to be successful at first. On their own, the ingredients are already pretty strong and assertive: maple syrup with it’s prominent sweetness, and curry powder with it’s pungent spiciness. Kinda polar opposites, right? Still, I gotta insist that you guys trust me on this: once you combine them together, they really really REALLY work well. The assertiveness of both spices, combined with the slight bitterness from the brussel sprouts creates this harmonious marriage of flavors (pun intended) that I was really very impressed with. It made for a delicious side dish that I’m definitely sticking in my bag of tricks to use repeatedly in the future. Line a sheet pan with parchment paper and coat evenly with cooking spray. 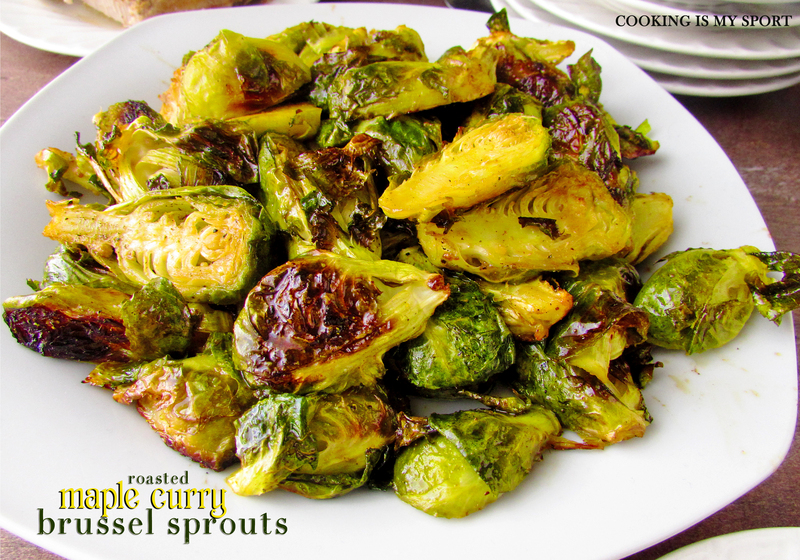 Toss Brussel sprouts with olive oil in a large bowl and season with salt and pepper. 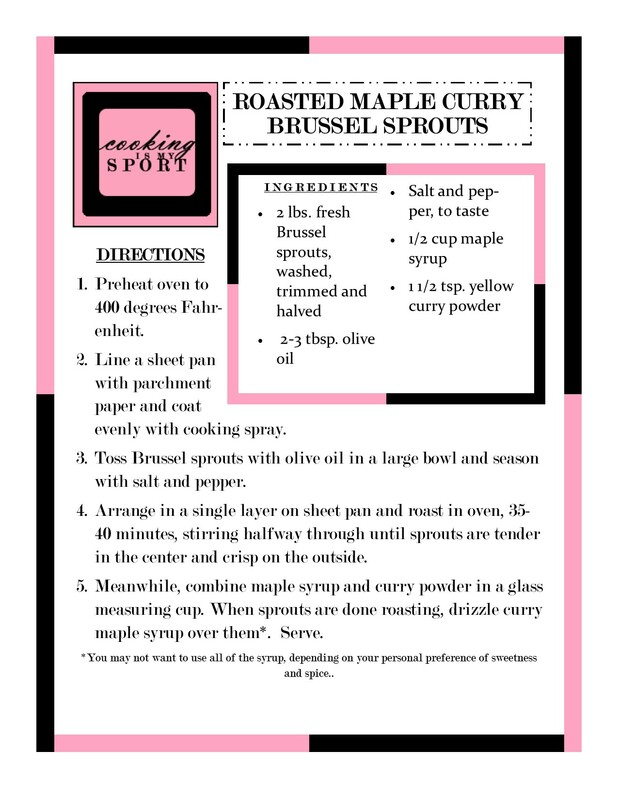 Arrange in a single layer on sheet pan and roast in oven, 35-40 minutes, stirring halfway through until sprouts are tender in the center and crisp on the outside. Meanwhile, combine maple syrup and curry powder in a glass measuring cup. 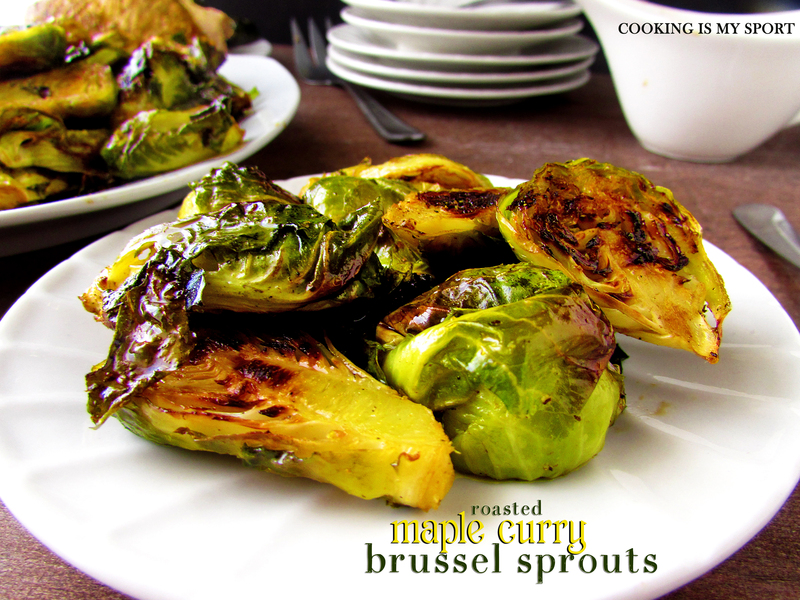 When sprouts are done roasting, drizzle curry maple syrup over them*. Serve. *You may not want to use all of the syrup, depending on your personal preference of sweetness and spice. Aww. I cried at one of my cousin’s weddings just because it dawned on me that she was leaving! I can’t imagine how it must feel when a twin’s getting married. You’ll be fine, honey. 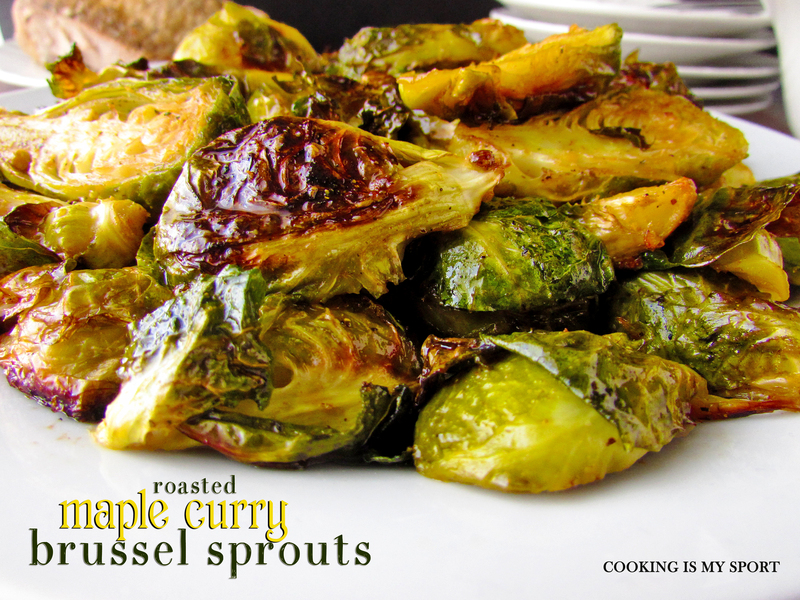 Btw, those brussel sprouts look amazing, and the recipe is so simple! I’m definitely going to give it a try! Aww, you’ll be fine. And she’s not so far away. Love the recipe! 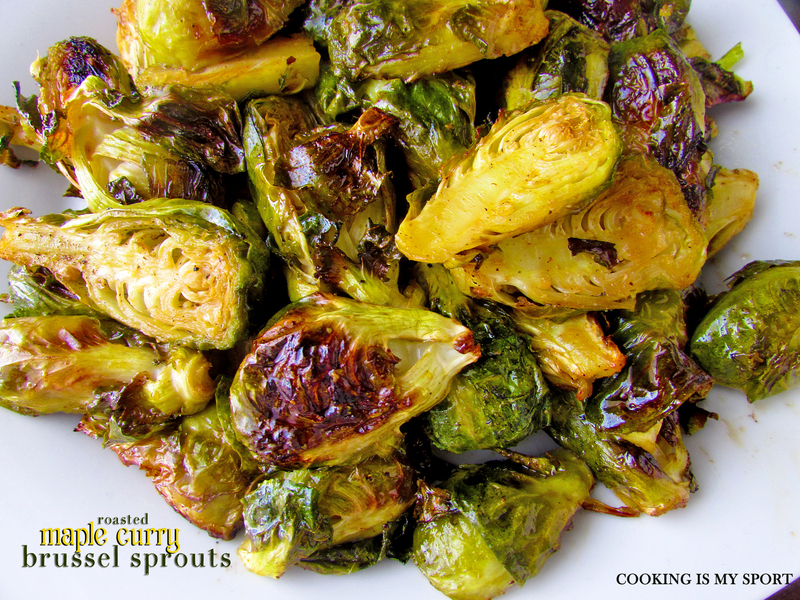 Great way to make brussel sprouts! Thank you Sudipti, I was really happy with how they turned out! I absolutely love roasted brussel sprouts. Yours look wonderful! I am intrigued by the use of curry with the maple syrup. It sounds really good. I am going to have to give it a try. Congratulations on your sister’s upcoming wedding. That is so exciting! I bet you will become even closer as you will treasure each time you get to be together. 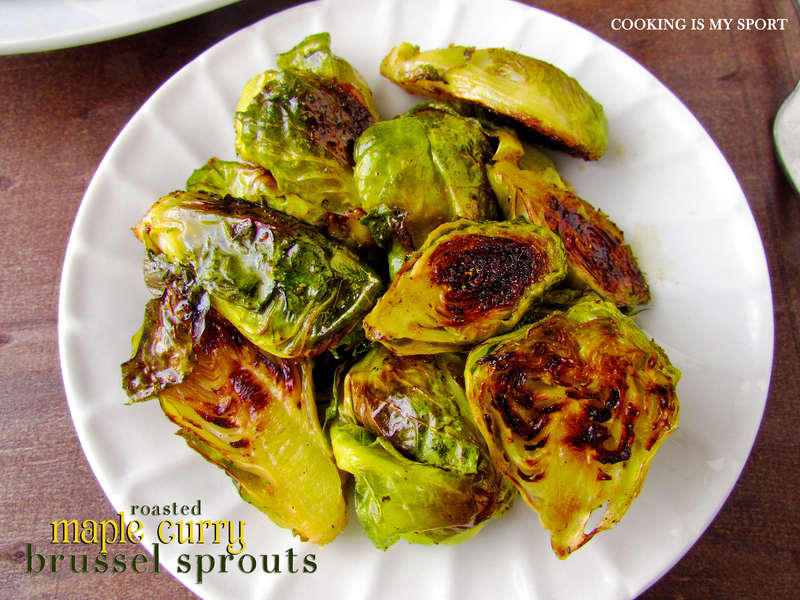 I love roasted brussels sprouts but have never had them with maple and curry flavors. This sounds so amazing. My husband thinks he doesn’t like them. I wont have to share. I will be different not living with your sis, but you can always fall back on that great relationship that you share and be that person that knows her better than she knows herself. I love getting together with my sisters and we always have a wonderful time. Aww…what a sweet post Jess! Love the recipe and many many many best wishes to your twin sister. It must be so lovely to have a twin! This looks good!! Its a daunting prospect but life has to move on.. She’ll never stop being your twin though! And you will have more memories to share with each other as time goes on! !